This key report, prepared for lawmakers and for President Trump, serves as a roadmap on how tech giants covertly silence online speech – and how America can ﬁght back against these monopolists working in sync with corporate media and left-leaning “fact checking” sites. To date, no one has assembled a comprehensive compendium of the aggressive censorship strategies and mechanisms now being deployed against users being targeted by the tech giants. 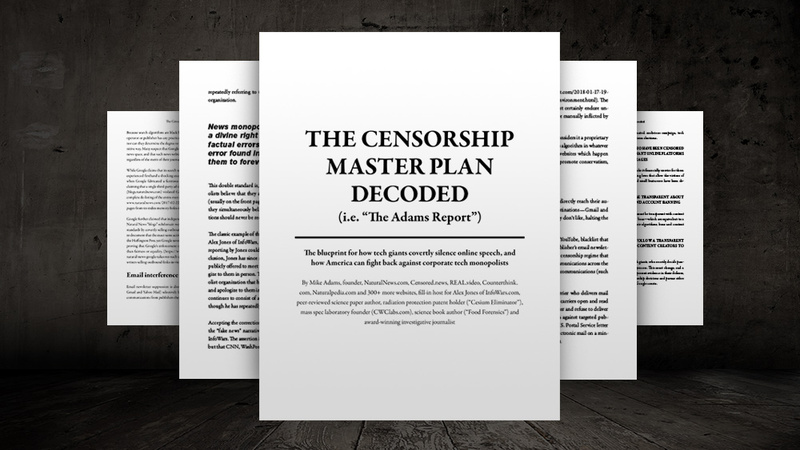 This document aims to serve as a primer “blueprint” to explain both the motivations behind the extreme censorship as well as the technical/mechanical means through which such censorship is carried out. This document should be required reading for any lawmaker or government official interested in protecting the freedom of speech that has served as a critical pillar in our society for over two centuries. The predominant argument of pro-censorship advocates largely consists of claiming that because Google, Facebook, etc., are private corporations, they can therefore engage in discriminatory censorship of any kind they wish, without restraint or regulatory oversight. This argument collapses when seen in the context of the broad recognition that participation in dominant online platforms has become essential for personal, social and professional interactions in the modern world. Just as citizens of fifty years ago could not meaningfully participate in society without phone or electricity service, today’s citizens cannot meaningfully participate in the modern world without an online presence, expressed through the dominant online communications platforms such as Facebook, Google, Twitter and YouTube. Dominant online platforms have become essential services for meaningful participation in modern society. This is further underscored by the fact that an individual’s online presence exerts forceful and lasting influence on their personal and social life, professional life, career opportunities and freedom of expression, including the freedom to engage in political debate that may influence others in elections. To be shadow banned by Facebook or YouTube today is as destructive to an individual’s quality of life as being surreptitiously cut off from phone and electricity services in the 1970’s, for example, or even denied the right to walk down a public sidewalk and chat with neighbors. Facebook is, in essence, the “public square” of modern life, with other adjunct services such as Twitter and YouTube serving similar social interaction functions. Yet no reasonable person would argue today that electricity companies, even though they are private corporations, should have to right to cut off electricity from targeted customers because the company disagrees with their politics. Similarly, internet service providers (ISPs) don’t cut off customers who use their services, even when those services are conduits for forms of expression with which the ISP may vehemently disagree. Yet according to the distorted justification of the political Left in America today, all private companies have the inherent right to refuse essential services to selected customers merely because they disagree with the political views of those customers. By this thinking, banks should refuse to lend money to Trump supporters. Housing builders should refuse to sell homes to conservatives. Gasoline stations should carry signs that read, “Conservatives not allowed to buy gas.” Even iPhone retailers, we’re told, should refuse to sell iPhones to customers who are Trump supporters, because they might use those iPhones to post pro-Trump comments that “offend” those who oppose Trump. In a society that has roundly rejected the idea that private businesses can discriminate against people based on the color of their skin, established media giants are openly demanding that private businesses now discriminate against people based on the color of their ideas. Because of the online nature of modern online, the censorship of individuals on the dominant online platforms of open expression is an attack on their very right to participate in society. No modern person can meaningfully participate in modern social and professional interactions without an online presence on one or more social media giants. They have become “essential services” for modern life, making them just as critical to modern survival as electricity, housing or phone service. Many on the political Left attempt to conflate these issues by citing the recent U.S. Supreme Court decision which concluded that a Christian baker in Colorado could not be compelled by the state to engage in artistic expression (decorating a cake) that violated his private religious convictions. According to Leftists who are increasingly devoid of logic and reason, this proves that private corporations can ban speech they don’t like. Yet the Christian baker (Jack Phillips) is not the Google of cake baking in the world and clearly does not control 90% of the cake decorating business in America. Gay customers were free to rather easily find a vast assortment of other cake shops that would gladly decorate the cake, and they did not need to violate someone’s religious beliefs in order to achieve that goal. Finally, Jack Phillips’ cake shop is not an essential public forum for modern society, quite obviously, and his refusal to engage in artistic expression against his wishes in no way harmed the gay customers beyond the mere inconvenience of walking down the street to another gay-friendly cake shop and engaging in a business transaction there. The tech giants now discriminating against individuals based on the color of their ideas — companies like Google, Facebook, YouTube and Twitter — have all pursued a central deception that has only now been exposed. Because of this central deception, platforms like Facebook rapidly expanded as individuals who had channels there promoted the Facebook platform to their own friends, family members and professional contacts. This allowed Facebook, Twitter, YouTube, etc., to rapidly expand and become the dominant platforms of online expression and social interaction. Once their dominant market position was achieved, they then started banning individuals based on the content of their ideas, deeply violating the original promise and pretense of the online service. In other words, only after conservatives helped Facebook become the dominant social media platform did Facebook cut them off from participating in that very platform. Facebook baited users for over a decade, exploited those users to build a dominant global platform, then cut off the speech of certain selected users whose speech it didn’t like. In this way, Facebook exploited the good will of its authentic users, then violated its social contract and business ethics, transforming its once-open platform into a discriminatory echo chamber policed by intolerant, small-minded Leftists who have repeatedly demonstrated zero tolerance toward speech that violates their own limited worldview. Facebook, in essence, baited users for over a decade, exploited those users to build a massive global platform that became the de facto standard for social media interaction, then cut off the speech of certain selected users whose speech it didn’t like. This means the very premise of Facebook has been a fraud from day one. If Facebook had launched its platform with its honest agenda: “Conservatives, Christians and straight white males are not welcomed here,” it never would have grown to become the dominant social media platform it has since achieved. The market dominance of Facebook, in other words, was entirely dependent on executing a “central deception” about its long-term agenda. Stated another way, the market success of today’s tech giants could never have been achieved if they had been honest about their true internal goals of discrimination and censorship. All of today’s dominant tech giants were built on fraud and deception. Click here for a fullscreen, printable version.